Dengue Dengue Dengue! is a tropical storm of electronic psychedelia directly from Lima, Perú. A project always in evolution, exploring rhythms and sounds from Peru and all over the world with electronic beats and basslines.. 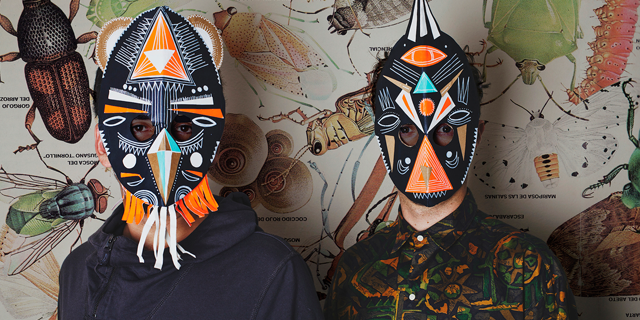 Behind the masks are Felipe Salmon and Rafael Pereira, two producers, dj’s and graphic designers. For their live performances they team up with Nadia Escalante (A.K.A. Vj Sixta) for a full Audiovisual Show. DDD was born in mid-2010 and immediately made themselves well known thanks to an impeccable audiovisual show, remixing and making mash-ups from their own tracks with old cumbias and modifying cumbia cult themes to electronic versions. All this always joined by amazing visuals and the always present masks. Argentian producer Pedro Canale aka Chancha Via Circuito returns from a three-year sojourn with his long awaited third album, Amansara. Originally coming out of Buenos Aires’s famed digital cumbia scene, Chancha has notoriously broken way outside those boundaries to forge unprecedented mergers between Brazilian rhythms, Paraguayan harp, Andean mysticism and the solitude of Argentinian folklore – all processed through his own futuristic style of post-dubstep. Chancha’s sound is without question truly unique and instantly recognizable to the point he has become a key reference point for an entire crop of artists that have begun to carry his genes. Hailed by the Washington Post, the New York Times, Pitchfork, NPR and countless others, Chancha Via Circuito defies even the shrewdest of marketing geniuses. On one hand, he is something of a cult artist within micro-circles of electronic music, having been invited to perform at Montreal’s MUTEK as well as the Roskilde and Vive Latino Festivals. At the same time, Chancha’s music has found broad appeal outside of the avant-garde, most notably his magnificent remix of José Larralde’s “Quimey Neuquén” which was heavily featured in 2013 as part of the final season of the critically acclaimed television series Breaking Bad. Fans of the show undoubtedly remember Walter White burying his millions in the desert, soundtracked by the wide and gentle grooves of Chancha Via Circuito.